Two summers ago when Sister Patty and I drove through Utah, we stopped at Zion National Park The beauty was breathtaking! 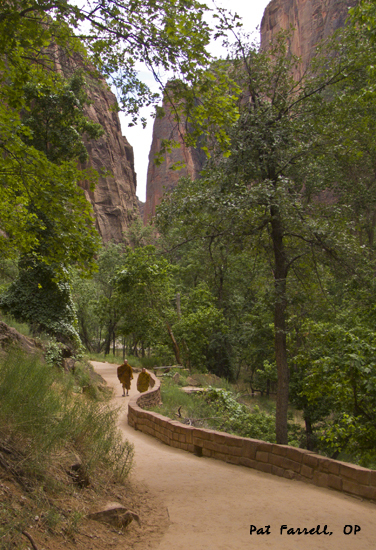 Words from Psalm 47 kept coming back to me, ” Walk through Zion, walk all around it . . .” And then I noticed to Buddhist monks on the path walking toward us. They, too, were enjoying the grandeur of the God of Zion. Walk through Zion, walk all round it; count the number of its towers. That such is our God, our God for ever and always. It is God who leads us.